Bad Weather Hampers Search For Missing Argentine Submarine : The Two-Way The ARA San Juan disappeared last week off the coast of Patagonia. Argentine officials say that they can't confirm that satellite signals received over the weekend came from the sub. 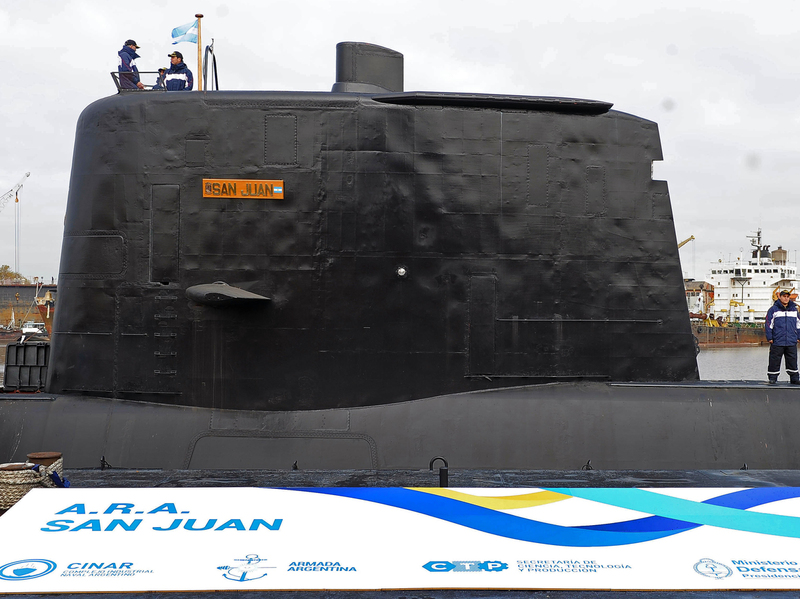 The conning tower of the ARA San Juan submarine shown as the vessel is being delivered to the Argentine Navy after an extensive refit in Buenos Aires, in May 2014. 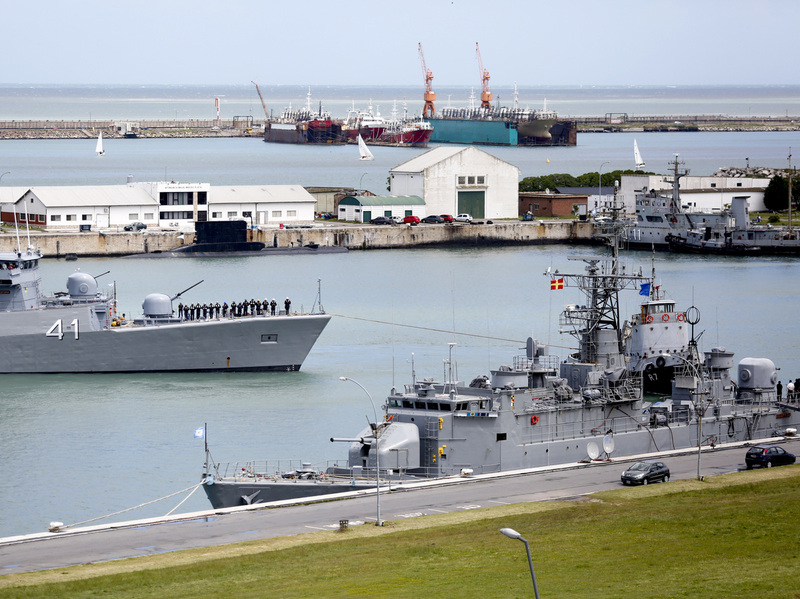 The naval base at Mar del Plata, Argentina, shown on Saturday. "We do not have clear evidence that (the calls) have come from that unit," Gonzalez said. "We are analyzing more closely to reliably determine that they were not calls coming from the submarine." The New York Times reports that Iridium, the satellite phone company, said it had "found no evidence that an Iridium phone aboard the vessel had been used since Wednesday morning." Reuters adds that Iridium says the last call detected came on Wednesday, the same day the submarine went silent. Navy spokesman Enrique Balbi, quoted by the AP, said the low-frequency satellite signals received on Saturday lasted only a "few seconds," but were initially thought to have been attempts by the crew to re-establish contact. The BBC reports that "It is thought that the submarine may have had communication difficulties caused by a power cut. Navy protocol dictates that a vessel should come to the surface if communication has been lost." NPR's Philip Reeves reports that officials say the crew should have enough food and oxygen aboard. He says the U.S. Navy was dispatching assistance from its Undersea Rescue Command headquartered in San Diego. "The equipment consists of one Bluefin 12D (Deep) UUV and three Iver 580 UUVs, which are operated by the U.S. Navy's recently-established Unmanned Undersea Vehicle Squadron 1, based in Pearl Harbor, Hawaii," the statement said. "The UUVs are uniquely capable to help in the search. Both types are capable of deploying quickly and searching wide areas of the ocean using Side Scan Sonar, a system that is used to efficiently create an image of large areas of the sea floor."